Alumni Find Foreign Language Skills an Advantage in the Workplace. As the population of international students and scholars continues to grow, the integration of campus resources to serve them is becoming more and more vital. 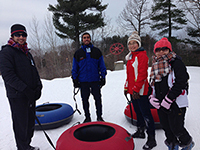 OISS collaborates with offices around campus, such as Dining, Housing, Campus Recreation, MUB, and ESL Institute. The UNH International Travel Registry will be live for the summer. If you have UNH-related international travel plans, please contact Beth Kilinc for registry details. Due to the student demographic of the college...it is extremely important for Manchester students to consider study away opportunities. This year's recipient, Stephanie Kuhn ’15, plans travel to the United Kingdom. Read story from The College Letter. Where in the world are your fellow graduates? Hear from alumni from China, Turkey, India, and South Korea. The Founders Fund for International Affairs was established to enable UNH undergraduate students from any major to expand their interests and career options into the international arena. Consider making a difference. CIE travel grants enable UNH faculty to pursue their professional endeavors around the world. 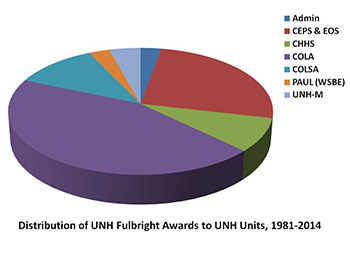 A short survey of UNH research with an international dimension.